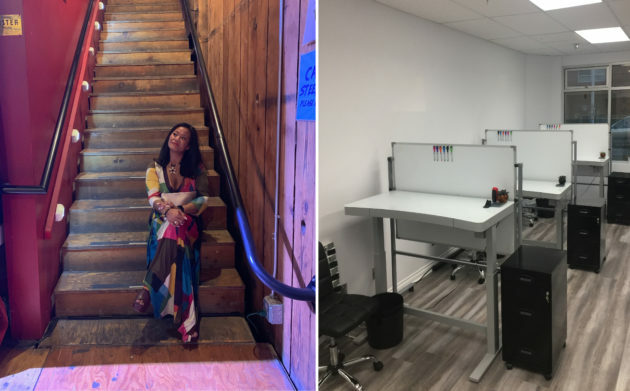 Eileen Carpenter and the co-working space at Tag. Photo courtesy of Tag Spaces. Tag Spaces is a stylish and modern new coworking business located in the U District. Owner Eileen Carpenter gained a great familiarity with the neighborhood when she worked as a Property Manager for ten apartment buildings in the U District. More recently, Carpenter was working in finance when she decided to open a female-focused space. Collaborating with her business partner Craig Smith, she set out to create a safe space for women to work. "I saw there was a need for startup entrepreneurs and freelancers. We decided to be open 24 hours a day to accommodate people with different work schedules and those who work with associates in different time zones," explained Carpenter. Clients can book online and pay a daily or monthly desk rental fee. Tag also rents a meeting area with seating for eight. Rental rates include high speed internet, printer, fax, refrigerator, coffee, and two free parking spots (on a first come first served basis). We are excited to welcome Tag Spaces to the neighborhood! If you would like to learn more, call to schedule a tour of this beautiful workspace.